Alaska Area Director of Indian Health Service Christopher Mandregan and Acting Director of Indian Health Service Rear Admiral Michael Weahkee tour SCF facilities. Each fall, Southcentral Foundation receives an increase of requests for site visits and facility tours to be given for U.S. government representatives and prospective grantors. Site visits give SCF an opportunity to share about the Nuka System of Care and how SCF has worked to drive down costs associated with health care by transforming service delivery. Tours give visitors a behind-the-scenes look at how integrated care teams interact with one another. 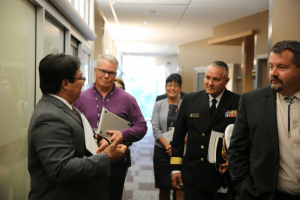 On Aug. 2, SCF welcomed Acting Director of Indian Health Service Rear Admiral Michael Weahkee along with Alaska Area Director of Indian Health Service Christopher Mandregan. RADM Weahkee met with SCF Vice President of Executive and Tribal Services Ileen Sylvester and Senior Medical Director of Quality Improvement Dr. Steve Tierney. They shared the steps SCF has taken to listen to the voice of the customer-owner and the process of transforming services to meet those needs. Aug. 29 brought Diane Kaplan, President and CEO of Rasmuson Foundation, and the annual Rasmuson Foundation Grantmakers Tour of Alaska to SCF. Guests of Rasmuson Foundation spent 45 minutes walking and talking through the Anchorage Native Primary Care Center with SCF President/CEO Dr. Katherine Gottlieb, SCF Senior Medical Director of Quality Assurance Dr. Donna Galbreath, and SCF Service Line Medical Director Dr. Matthew Hirschfeld. SCF encourages and welcomes visitors to learn about the Nuka System of Care and wants to thank RADM Weahkee and the grantors of the 2017 Rasmuson Foundation Grantmakers tour for taking time to listen, learn, and ask questions.